Originally published on INALJ on June 24. I moved to downtown Chicago 3 years ago, and since then, I’ve learned a lot about navigating Chicago, and what kind of free things there are to do. I’m focusing on the most common issues and concerns I’ve noticed among tourists, and on things that us busy librarians can probably find time to do. This post is divided into three sections: Safety, Transit, and See This, Not That. Downtown Chicago is actually a pretty safe place despite what some of the people who post online about #ala13 are saying. You are going to be just fine as long as you keep your wits about you and don’t do stupid things. Beware of ”Apple-picking.” It’s where people will “pick” phones from unaware peoples’ hands, particularly on the CTA. You can check your phones occasionally, but keep a firm grip and be especially aware when the train/bus is stopped and the doors are open. Most homeless are quite safe—they just sit on milk crates quietly. Some are funny and make jokes when asking for money. You can give them change as you walk by, but you don’t have to. I recommend keeping it in a pocket or an exterior part of your purse so you don’t have to take out your wallet. 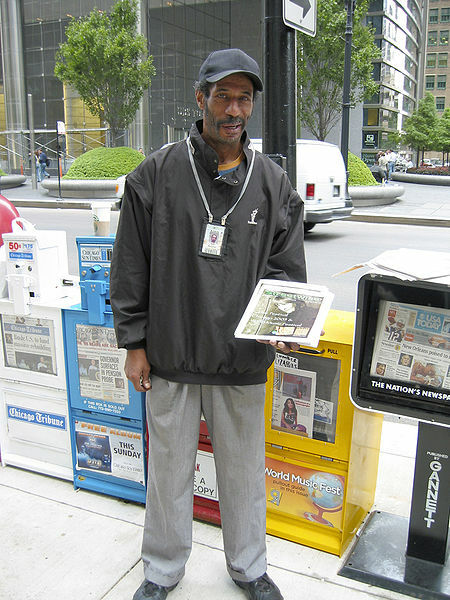 People with the laminated “Homeless” are OK. It’s part of a legit project by Christopher Devine to try to help make people more aware of the homeless. Ignore the aggressive panhandlers as they are breaking the law. They will come up to you asking for money using a sob story, and they will pester you. Some even use their children as props. Some pretend their car is broken down. You can be polite or be forceful, but just say NO. And repeat it as necessary. One trick for the sob-story scammers is to offer to call the police for them so they can get help (never lend your phone)—they will often refuse the assistance. People who sell the Onion are scammers. The Onion is a free publication. People who sell Streetwise are OK.It is a legit program. The hip hop guys on Michigan Avenue (Kings of Michigan Avenue) are awesome. People who try to force a shoe-shine on you in the streets are scammers. They’ll shine your shoes with pink bathroom soap (or occasionally actual shoe polish) and ask for money. This is against the law, and most of the shoe shiners have had many, many run in with the police. Keep wallets and phones in the front pocket. NOT the back pocket. Keep purses closed and secured. Never leave it sitting unattended to the side of you, and especially not gaping open. Don’t wear your conference badge out and about. Stow them. Otherwise you’re practically screaming “I’M A TARGET” to pickpockets. Buskers—people who play music or sing in the train stations—are legit. They’re required to have their permit visible, and they are allowed to collect tips. The CTA is fast (except buses in traffic), reliable (except when stuck in traffic), and takes you anywhere in the city for cheap. Buy 1, 3, or 7-day passes while you’re in town, and you can get unlimited rides during that time. It’s a lot cheaper than a cab, and you’ll get a better taste of the city. Even with the CTA, you are going to be walking a lot. Be warned, and wear comfy shoes. There are free CTA apps for both iPhone and Androids. Download them, try them out. I have no specific recommendations—they all do basically the same thing. Or you can go to the CTA’s website and track buses or trains from your phone’s browser, instead. Google Maps has transit options when getting directions. I’ve found it to be quite reliable. Passes can be bought at the airport, in train stations, and at Walgreens/CVS. Take the train in from the airport, whether it’s O’Hare or Midway. The Blue and Orange lines are FAR cheaper than cabs. Scoot in closer to let more people on the trains and buses. It’s Chicago. You are not going to have 3 square feet of personal space on transit. It’s not unusual for the buses and trains to be crammed almost as tight as sardines during rush hour. It’s okay to squeeze in between people in order to get off the train or bus—I recommend letting people in the way know that you’re getting off at the next stop so they can be prepared to move. If you go to a Cubs game, expect to be completely squished on the Red Line. Move to the back of the bus. Yes, even the raised back part of the bus. Don’t stop in the middle of a busy sidewalk to check your phone or talk with a friend. Pull over so you don’t impede traffic. Feel free to ask people for directions. Chicagoans are a friendly bunch, and police and CTA employees can help with directions, too. There are many options for renting a bike, from the new Divvy bike rental program to companies like Bike and Roll. I do prefer and recommend Bike and Roll over the other companies. But please, rent a real bike and not one of those quad bikes with single speeds. The quad bikes are too wide for the sidewalks and bulky to maneuver. Riding bikes on the sidewalk in the City of Chicago is illegal. Please, please use the roads, park trails/sidewalks (but not in Millennium Park), and bike lanes. It’s much safer for you and for us pedestrians. You don’t have to use the bike lanes if you don’t want to—it’s perfectly legal to bike in the regular traffic lanes, even if the drivers flip you off. Follow the regular rules of the road. Chicago has a lot of free and cheap options for entertainment and sightseeing. I’m not recommending anything here that’s pricy, unless it’s worth it. Marina City at State and Wacker is really neat. If you go down to the Vietnam Memorial park that’s to the east of State Street, you can get a good picture of the building up against the sky. Go to Ohio Street Beach for a neat panorama view of the city, including the Hancock. Olive Park next to it is also a good place to get a scenic view. Northerly Island offers a scenic, distance view of the city, too. It’s just east of McCormick Place, but you have to go all the way to Adler Planetarium in order to actually get on the “island.” They’re working on terraforming it so it doesn’t look like a former airport anymore. Millennium Park and area are gorgeous. 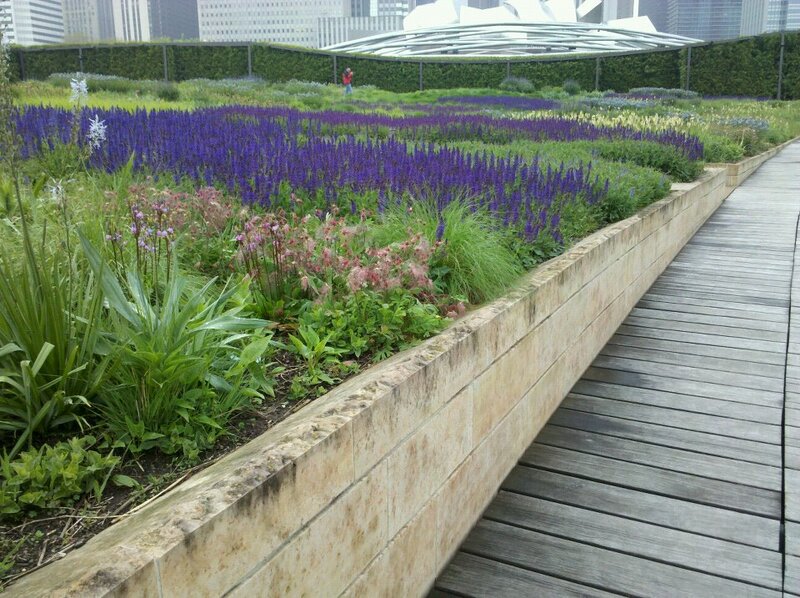 My favorite park there is the Lurie Gardens, just north of the Art Institute. The Bean (okay, Cloud Gate) is always fun to take pictures of. There are free classical concerts at the Jay Pritzker Pavilion in Millennium Park. You can even listen in on the rehearsals, too! Wine and beer is often served, and it’s allowed within the gated areas if you want to bring your own. Just don’t expect to take the open bottle out of the area, because open container laws apply. The planetarium and the Shedd are overrated. The Field Museum is where it’s at. Don’t call it the Willis Tower. It will always be the Sears Tower to us. Also, The observation decks at the Sears and Hancock buildings are overrated, especially for the prices they charge. If you must, you can go up to the bar in the Hancock and get a good view for the price of a drink—half the price of admission to the observation deck. Food and drink is mediocre, but the view makes it better. The view from the ladies’ room is AWESOME. Guys, I don’t think you have the same view in your loo, unfortunately. Just for the ladies. Boat tours are actually pretty nice, if you have a little extra money and time. Shoreline and Wendella are the two big ones, and you can choose a lake cruise, a river cruise, or a combo. They board along the river and at Navy Pier. 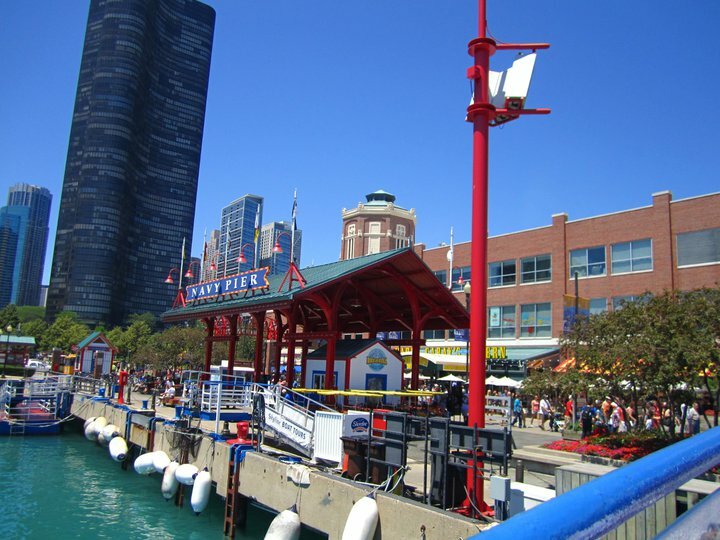 Navy Pier is a tourist trap with overpriced foods. Go there only to get on the boats.Or to ride the Ferris Wheel–that part is okay, too. The Art Institute is always excellent. This entry was posted in Library Science and tagged ala13, chicago. Bookmark the permalink.